René is a freelance Consultant Forensic Anthropologist in Ireland. He trained as a Medical Dissector/Prosector in Berlin, Heidelberg and Düsseldorf in Germany and pursued doctoral research studies in Forensic Anthropology and Human Anatomy at University College Dublin in Ireland. 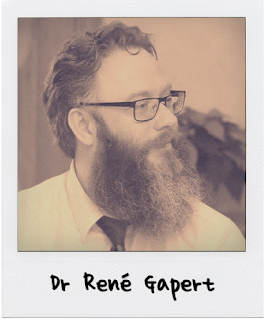 Dr Gapert holds a PhD in Forensic Anthropology/Anatomy and a Professional Certificate in Forensic Radiography. He is an accredited Forensic Anthropologist under the UK Justice System and has over 20 years of experience in the dissection of the structures of the human body and 14 years of experience in the examination and analysis of human remains in forensic and historical contexts. After over 15 years working in a University environment I have finally set up my own consultancy as a forensic anthropologist. I found that that I needed more time to invest in case work and interesting research projects which would have been difficult to pursue otherwise. The same as my day job. I am 24/7 on call. I always had an amateur interest in history and particularly my own. I am originally from Germany and was able to follow back both my parents’ families to just before the start of the Second World War. Unfortunately, I have not been able to find out anything further back due to the lack of or destruction of family records during the war. My involvement with genetic genealogy came by accident as I was contacted by Roger Du Barry and James Barry of the Barrymore DNA Project in my capacity as forensic anthropologist. They were looking for some advice on the possible sampling and testing of human remains located in a crypt in Castlelyons, Co. Cork and I was able to help them with the licensing issues. I suggested analysing the remains from a forensic anthropological perspective prior to any destructive sampling. They agreed and here we are now. My plan is to briefly introduce the field of forensic anthropology and how I came to be involved with the project. To my knowledge this is the first time that human remains were accessed in Ireland for anthropological and genetic genealogical purposes and I will outline the processes we went through from first permissions to final testing. As the project is ongoing and I am hoping to access the remains again before the conference for further examinations, it may be possible to add some more unknown details. Overall, I hope that my talk will provide an interesting insight into a multi-disciplinary approach to genealogical research which may give other research groups ideas for further projects. - What does a forensic anthropologist do? - What are the ethical and legal considerations around human remains testing for genealogy? - What examinations have been carried out in the Barrymore DNA Project? - What are the results of these (anthropological) examinations? - Can forensic anthropology be used in my/our own genealogical research? I will only discuss the actual sampling of the remains and leave the DNA discussion to James Barry.